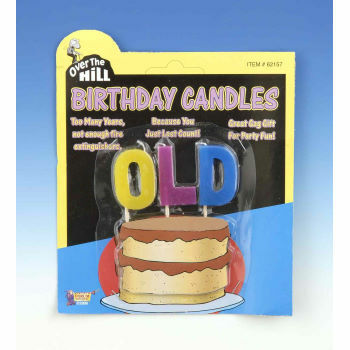 When it gets to the point where putting candles on the birthday cake for your age is considered a fire hazard, then it's time to replace them with three simple letters, O-L-D. 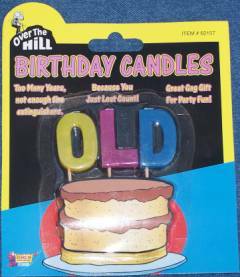 These OLD candles will get a chuckle from the birthday boy or girl. Whether they are 35 or 85, everyone will recognize they have finally made it over the hill and joined the ranks of the geriatric. Their bones may creak and they may not be as regular as they used to be, so let them have the thrill of officially being over the hill with the OLD candles. We love OLD candles because it keeps everyone safe from the blazing inferno that is your birthday cake. No one wants to go to a birthday party and suffer third degree burns, so let’s just put it out there. You’re old. Age may be just a number, but for you, it’s a big one.